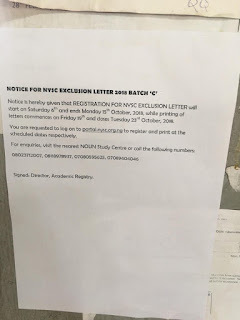 Home / Unlabelled / Notice To All Students - NYSC Exclusion Letter Batch "C"
Notice To All Students - NYSC Exclusion Letter Batch "C"
Notice is to hereby given that REGUSTERATION FOR THE EXCLUSION LETTER Will start on Saturday 6th and Ends on Monday Oct. 15th 2018. While printing of letter commences on Friday 19th and Closes Tuesday 23rd October 2018. 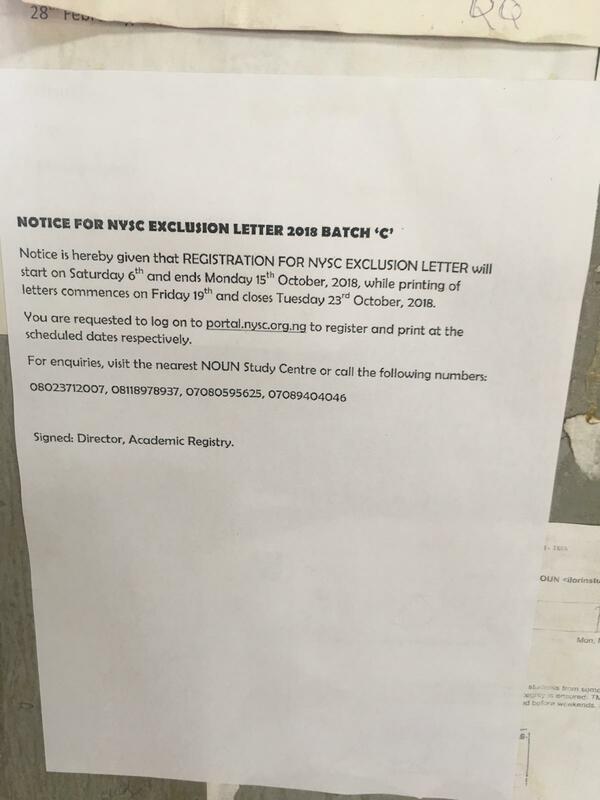 You're requested to log on to portal .nysc.org.ng to register and print our scheduled dates respectively. The UP Police Re-Exam Admit Card 2018 for 41520 vacancies re-exam will be released soon at the official website of UPPRPB that is prpb.gov.in or uppbpb.gov.in. The UP Police Call Letter 2018 of Constable post will be available for 2nd Shift Re-exam which is going to be held on 25th & 26th October 2018. Candidates, who have applied for UP Police Constable Vacancy 2018 will be able to download their admit card by using their registration number and date of birth.